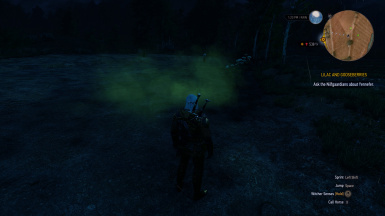 This mod increases the number of particles per particle effect, recolors several effects (including both forms of Igni and the Devil's Puffball bomb), adds particle collision to monsters and Geralt, and makes many particle effects respond to the wind. Fixed an issue pertaining to the primary form of Igni, whereby one of the particle systems failed to emit visible particles. 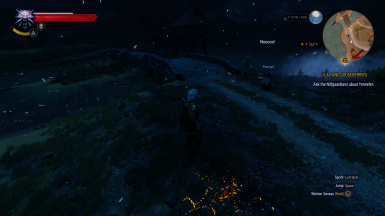 Added particle collision for Geralt and large monsters. This means that they disturb fog and gas when they walk. Geralt's version still needs a little work. Added windInfluence to and increased the particle count of blood effects. Tweaked the primary version of Igni so that the wind effect is less intense. Increased the spawn-rate for most fire particles. Added windInfluence to and increased the particle count of walking and rolling effects. 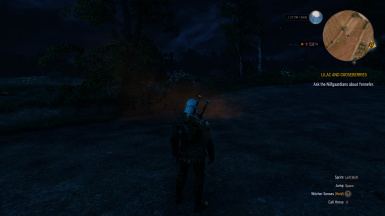 Fixed a bug, whereby the primary version of Igni would have active emitters long after it was cast in certain locations (usually Velen). 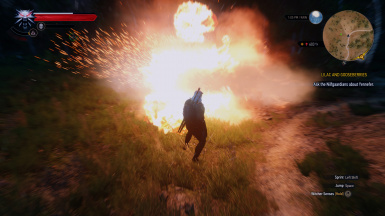 Added windInfluence to and increased the particle count of: NPC and Monster-related particle effects, PhysX APEX destruction, dust, fog, collision effects, smoke from pipes, explosions, sparks from explosions, snow, frost, and environmental gas. Fixed an issue whereby aard sweep produced a cloud of dust far away from the caster. Fixed an issue whereby the Yrden turret itself, rather than the sparks produced when it attacks, was interacting with the wind. Fixed an issue whereby the primary mode of casting Igni would not support wind influence. 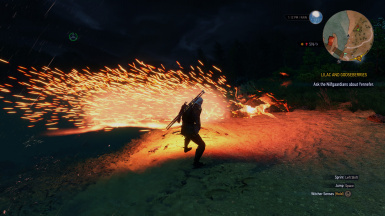 After visiting an old thread on the RED forums (http://forums.cdprojektred.com/forum/en/the-witcher-series/the-witcher-3-wild-hunt/mod-discussions/61490-igni-effects-and-particles), where a mod was created to make the firestream form of Igni influenced by the wind, I found that the testmod provided by SirRod1415, although very interesting in principle, had a few issues. 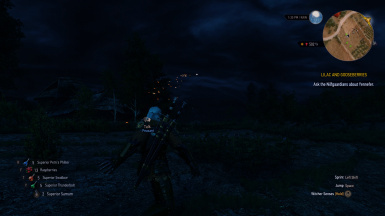 Firstly, it didn't really change anything about the secondary form of Igni other than wind influence; secondly, the effect was a bit too strong, and focused solely on the embers at the tip of the stream; thirdly, it only applied to, as stated previously, the alternate casting of Igni. 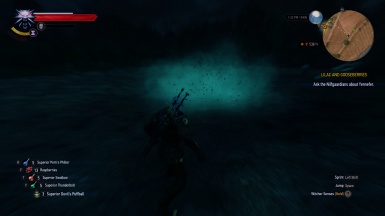 Inspired, I created this mod so that the modified particle effects' erstwhile limitations would be no more. Igni particles (now both primary and secondary). Quen particles (released when an upgraded version of Quen ruptures). Sparks from the secondary form of Yrden. 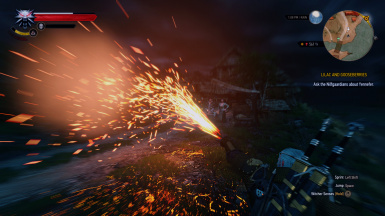 Smoke (including unique types, such as those found in Novigrad, White Orchard, and the Bloody Baron's Castle). Sparks generated by fire (as above, including unique types). Fire (once again, including those types which are used in only a single region). Smoke and sparks from the fuses of all bombs. Smoke/gas clouds generated by the detonation of Devil's Puffball, Dimeritium, Dragon's Dream, and Samum Bombs. PhysX APEX destruction (both particles and debris). 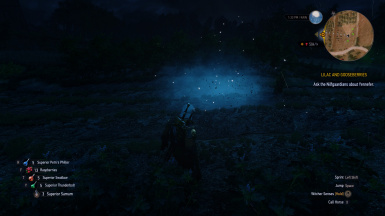 Monster and NPC-related particle effects (including magic). Collision effects (wood chips, sparks, etc.). 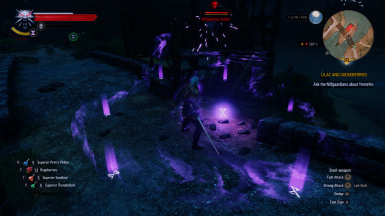 Sparks from the secondary form of Yrden and particles released when the trap disappears. Both forms of Igni (made redder). Devil's Puffball gas (made a more vivid shade of chartreuse). 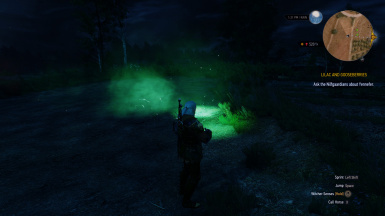 Environmental gas (made, as above, a more vibrant green). Other large monsters which use fx\decoration\walk_fx\big\stone\stone_walk_fx.w2p. 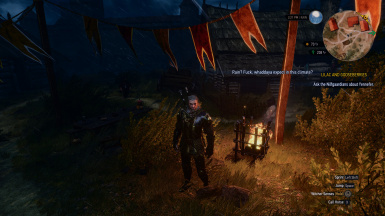 Geralt (sort of - I will be working on better collision for Geralt). Effects from Hearts of Stone and Blood and Wine. 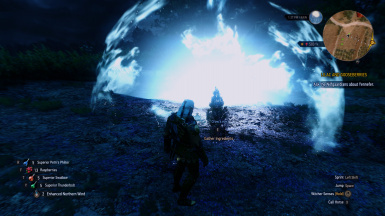 To add more realistic particle collision to Geralt. Extract the file "modImprovedParticleSystems.rar" using a suitable program (you should probably use winrar). 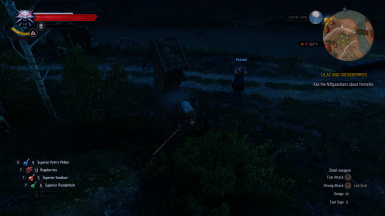 Copy the folder "modImprovedParticleSystems.rar" to [Witcher 3 Directory]/mods, where [Witcher 3 Directory] is the address of TW3 on your computer. As an example, mine is "C:\Program Files\Steam\steamapps\common\The Witcher 3\". If you experience the issue with CTDs during fast travel, try recompiling your mod files. Look at the relevant issue in the "bugs" section for detailed instructions on how to do this. 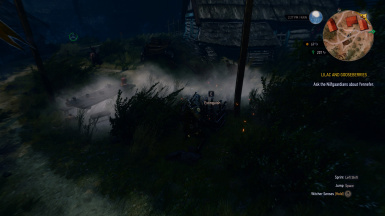 Alternative Chimney Smoke By GMSBS_Ghost (http://forums.cdprojektred.com/forum/en/the-witcher-series/the-witcher-3-wild-hunt/mod-discussions/8259220-mod-compilation-alternative-chimney-smoke). 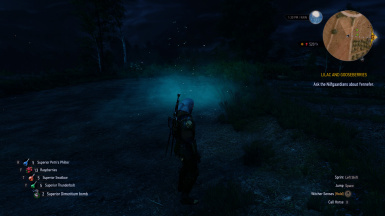 Skellige Ice Breath By CAPA (http://www.nexusmods.com/witcher3/mods/1257/?). 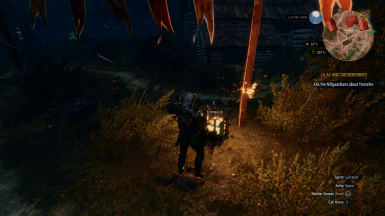 Improved Sign Effects by Lunayah (http://www.nexusmods.com/witcher3/mods/995/?). 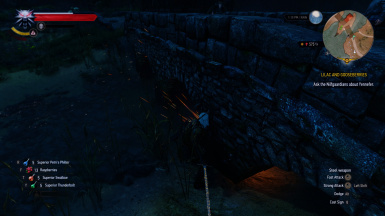 The Aard By CAPA (http://www.nexusmods.com/witcher3/mods/2346/?). 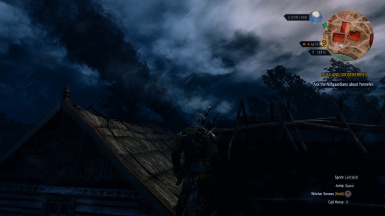 Cinematic Realism Reshade By Steamin661 (http://www.nexusmods.com/witcher3/mods/2188/?). NOTE: As I took inspiration from SirRod's mod, but did not use his code for wind-influence, I am crediting him only (unofficially) as the source of said inspiration. Finally, I must warn you, mortal PCs beware!